Having a sensitive skin is not easy because popular skin care brands are not always suitable for our skin. Looking for a good product is a long journey that can take both take time and money as well as trial and error on our skin but today, there are lots of manufacturers offering sensitive skin-friendly solution for our skin such as those from Cetaphil vs Eucerin. While they are similar, both brands also has some differences. If you wonder which the better option is, go check our article below. Skin may look tough on the outside but they are actually prone to dryness because even water can strip their natural moisture. Hydration is one of the key to a healthy, beautiful skin which is why it is not recommended to use a drying or harsh cleanser when washing our skin including face. However, a proper soap is needed to help us removing or cleansing the skin from dirt and makeup that will block pores and causing problems like acnes as well as promoting blood flow. The massaging motion while cleansing our face is thought to have a good effect on our skin since it will help increasing blood flow to make sure our skin is properly receiving the nutrients from our body. Soap at the other hand can do more than just cleansing because most cleansers are enriched with beneficial ingredient to support the skin whether it is to add some moisture, minimize oil production, kills bacteria, whitening, firming and many more benefit we can get from a face soap/facial wash. However, just like our other skin care, face soap is not something we can just purchase and use since we will need a good understanding on how the product will suit our skin type and whether it has the promising ingredient to support the claim and benefit. The next is make sure to wash our face twice a day because while night cleansing is important to strip and remove those dirt and makeup from the skin, morning routine is needed as well. At night, our skin is eliminating toxins through pores so it is better to start our day with a clean and fresh skin to make sure it can absorb the next skin care products properly. In last several years, double cleansing is very popular because it is thought to cleanse our face better, especially those who wear makeup throughout the day. However, people with oily skin is the one who will get the most benefit from double cleansing while sensitive skin owner may want to switch to water for the second step. If you are not wearing a heavy makeup during the day and have a dry skin, sensitive skin owner may want to pass double cleansing or use a simple oil based-makeup remover then continued with a soft cleanser. 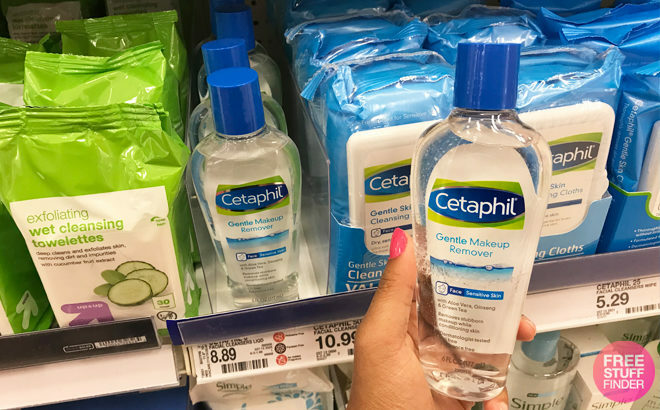 When it comes to gentle cleanser, the first brand comes to our mind is Cetaphil because it is one of the most well-known skin care brand that market their items as a non-irritating product which should be suitable for sensitive skin. 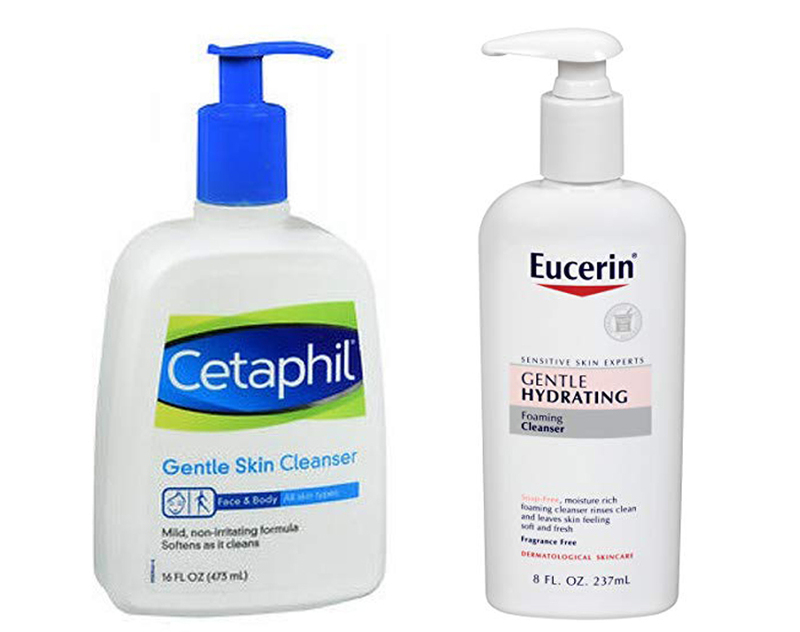 Cetaphil is a huge brand but their most popular cleanser is the Gentle Skin Cleanser like in our sample picture above. This product is claimed to be gentle on skin with non-irritating formulation that will help skin by soothing while cleansing and even claimed to be suitable for baby’s gentle delicate skin. It is said to be suitable for all skin type so you don’t have to have a certain skin type to use the cleanser. The most important thing we have to check when looking for a skincare product is their ingredient list since here we can see whether the product will suit our skin or not. The first ingredient in Cetaphil is water and continued with cetyl alcohol or fatty alcohol like stearyl alcohol. This is not the same like the regular one which is bad for dry skin since fatty alcohol may benefit dry skin for it has a moisturizing effect. Next is propylene glycol and it is here to make sure the formulation won’t melt nor freezing but it can also allow ingredients to be absorbs better into skin. With a claim of non-irritating, we are surprised to see SLS in Cetaphil formulation because as you may already know, this is one of the most sensitizing cleansing agents used today which makes researchers establish a way to measure whether something is problematic ingredient or not when compared to SLS. However, the effect is not a dire and life threatening like we used to see floating from one forum to another and more like it is not a good thing for skin and even in 2% amount, some people still can get a sensitizing reaction from it. The next one is called methylparaben and taken from Healthline, it is currently investigated whether the ingredient is safe or not because of the high concern of cancer risk. In cosmetic, it is used as an antifungal and preservative so we can actually see it present in many other products which mean it has a similar function as the next two called propylparaben and butylparaben. As for the latter, there is a study done by National Food Institute, Technical University of Denmark where the ingredient can have a disrupting effect to endocrine on rats reproductive system that are exposed to the compound prenatally. Cetaphil has no fragrance so there is no certain smell here which can be a good or bad news depend on your taste. Its texture is gel like and in a white color which is quite thick at first but will turn into a clear solution after a while. It spreads really well on skin but the most interesting part is we can use it “dry” or without water and with water so for those who loves to get on an adventure and have no near source or clean water can still cleanse their skin. When looking for something, it is best to compare it with another similar product so we will know which more promising or have certain traits we love better and for those who need a gentle cleanser, Eucerin also have the perfect choice. Eucerin is a manufacturer of skin care but they are more popular with the emollient or ointment line to help those people with extra dry skin by hydrating and locking the moisture. If you are interested, check it on our Aquaphor vs Eucerin here. The one we are picking in this article is their gentle cleanser called Gentle Hydrating Foam Cleanser. This product is claimed to be suitable for sensitive skin owner and able to cleanse the skin with a moisture-rich lather while leaving the skin fresh and soft without any soap residue. Similar like Cetaphil, Eucerin also use SLS and being placed next to its main ingredient means it has quite the amount. The next one is not as bad since they use Cocamidopropyl betaine which is the safe bet cleansing agent because it is very soft and very mild for adult skin or hair while Disodium Cocoamphodiacetate is the foaming agent that is similarly mild. Glycol Stearate is a waxy solid often used to increase thickness and reduce the clear-transparent appearance of solution. PEG-7 Glyceryl Cocoate is used here to enhance the formulation but it will give a conditioning effect, leaving your skin smooth and soft after application. Cocamide MEA is derived from coconut fruit and used to add opacity and thicken Eucerin formulation. Laureth-10 is an emulsifier and Citric Acid here is used to help the cleanser to strip or slough off dead skin cells so they can regenerate faster and better. It does promote skin growth which mean it will benefit those with a concern of aging and acne spots or scars. PEG-120 Methyl Glucose Dioleate has the same function as Laureth-10 while the next Lanolin alcohol is beneficial for moisturizing skin and have no sanitizing effect like the regular alcohol. The last is Imidazolidinyl Urea which is used as an antimicrobial preservative. Similar like Cetaphil, Eucerin have no fragrance so there is no pleasant or unpleasant smell here. It has a nice consistency and foam really well as well as rich so it can help removing the makeup residue from our face and leaving our skin fresh as well as supple. Now, let’s compare Cetaphil with Eucerin. As you may already know, the difference between them is on their ingredient since they have a different formulation yet still use SLS as the main cleansing agent. Cetaphil can be used both with and without water while we have to use water to foam Eucerin and wash the residue along with foam through water. Comparing the two, Eucerin is foamier but, not as easy to use as Cetaphil. - Eucerin Cleanser: Creates a moisture-rich lather that leaves skin feeling soft and clean. - Rinses away easily leaving. Your skin refreshed and free of soapy residue. All in all, the decision is all yours to make because we may have different taste and preference so it is best to suit the cleanser with your need. However, if we are to choose, we do prefer Cetaphil because it can be used as a dry cleanser and regular wash as needed.